A bridesmaid bouquet should always compliment the bridal bouquet - never overshadowing it whether in size or flowers. The colors and flower varieties are often repeated in corsages, boutonnieres, church flowers and reception decorations. 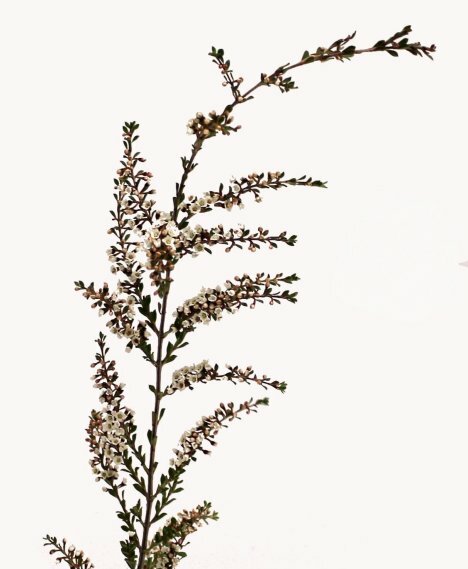 It is wise to make up "recipes" for every flower design you create, so you can count up the number of stem needed and order the correct amount. Once the flowers arrive, you can separate them by laying aside everything you need in different buckets. 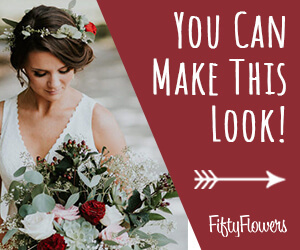 This ensures that you won't "over design" and use too many flowers in your early designs and run yourself short later when cunstructing your corsages and boutonnieres. 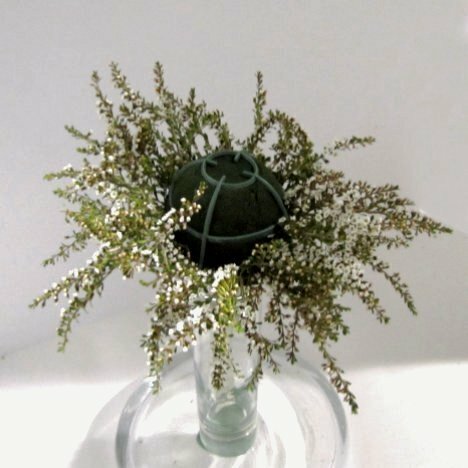 For this particular tutorial, I begin by choosing a filler flower to create a flower collar around the outer circumference of the bouquet. I used calcynia, which has a strong, woody stem that has laterals of tiny white flowers. 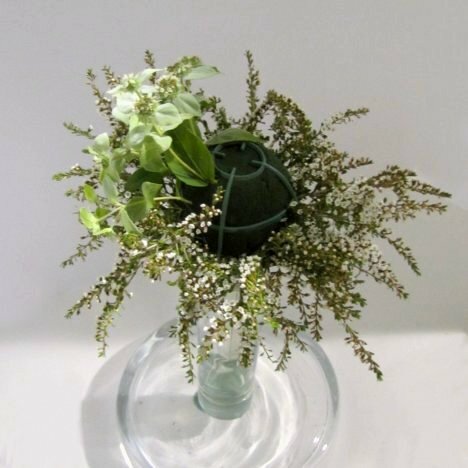 Cut the Calcynia into smaller sprays and insert all around the outside of the Elegant Bouquet holder. I filled the center in with a contrasting green. 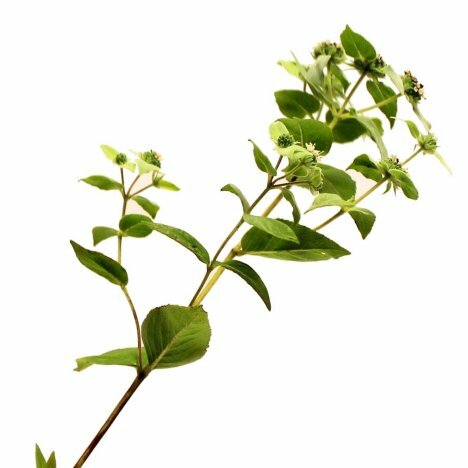 I used Mountain Mint, which, unfortunately has a very short season. 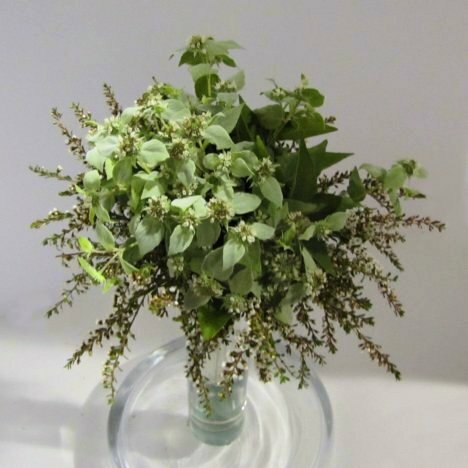 I recommend that during it's off season time you substitute a different greenery like bupleurum or baby blue eucalyptus. Cut the stems into shorter laterals and insert them into the center of the foam. 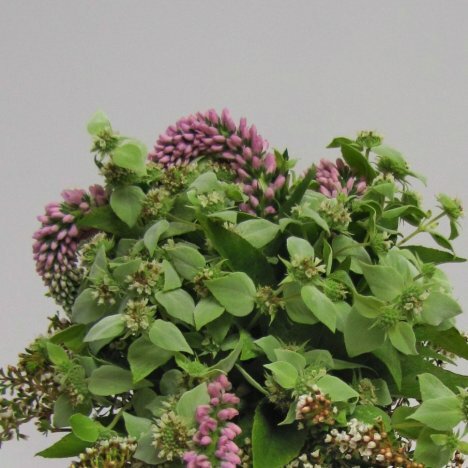 It fills in quickly, providing an interesting texture and backdrop for your flowers. 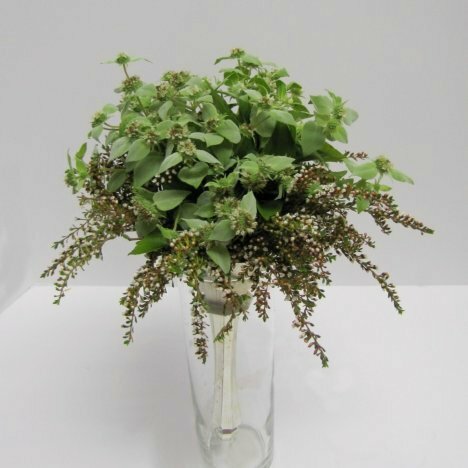 The bouquet is soon ready to insert your first flower stems. 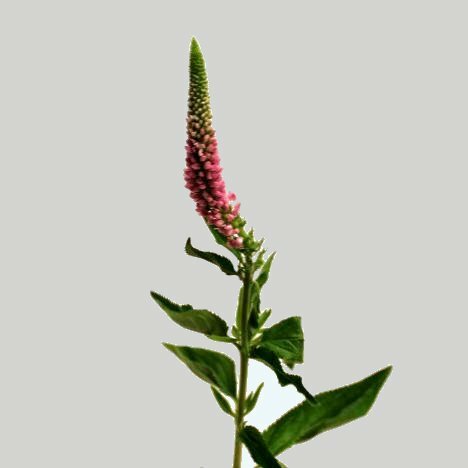 I love the cone shape and pretty pinks of Veronica. 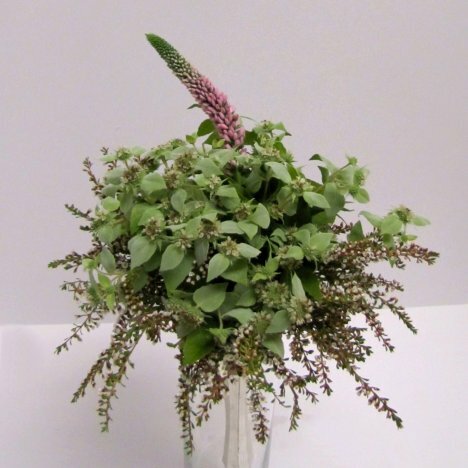 I'm going to use the flexibility of these flowers to create an unusual look for this bouquet. I cut the stem short in inserted it into the top center of the bouquet design. I then added a second stem close to the first. 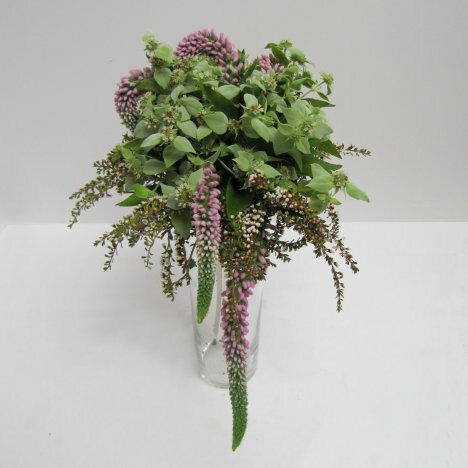 Clustering same flower varieties can give more impact at times that is different from perfect mixing and spacing flower heads evenly. I cut a slightly longer lateral and inserted it into the bottom right of the bouquet. 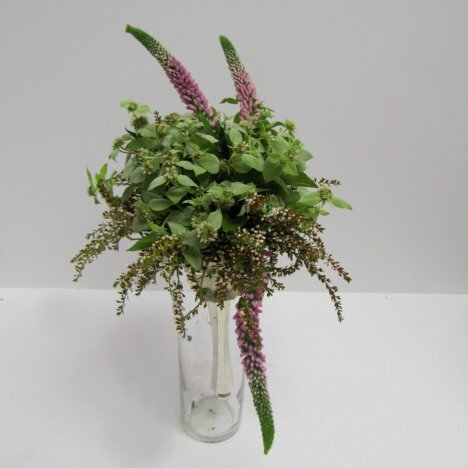 Again, I inserted another stem of the Veronica near the bottom stem, creating a short cascade effect. The Veronica tips at the top of this bridesmaid bouquet have been pinned down with a pearl headed corsage pin, creating a unique effect of a bowed flower head. 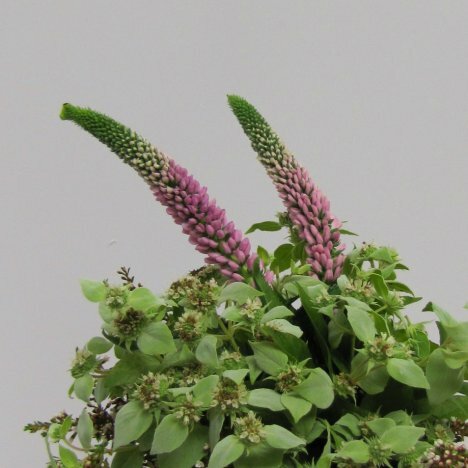 You can see this effect easier in this closeup photo of the top Veronica stems.